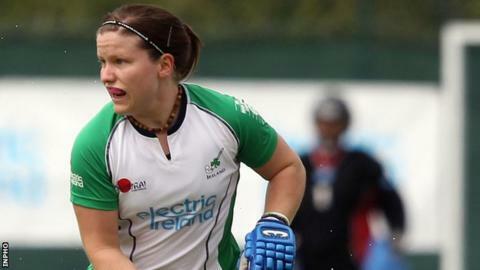 Ireland suffered defeat at the hands of Belarus in their second World League Two game in Valencia on Tuesday. Ireland paid the price for unforced errors and a lack of ability to finish off chances against a determined Belarus side. Batura put Belarus ahead with 15 minutes left and Strayezhka sealed the victory in the dying minutes. Ireland, who beat the Czech Republic 4-1 in their opener, take on hosts Spain on Saturday. Belarus had the better of the first half without creating many clear-cut scoring opportunities. Ireland were guilty of turning the ball over in the middle of the field and they struggled to find any real rhythm. The Irish began the second half with renewed energy but they failed to take their chances. Ireland's turnover of the ball certainly improved in the half but a lapse of concentration saw Belarus nick the ball back and slide the ball just inches wide in a one-on-one with Ireland keeper Emma Gray. Batura deflected a penalty corner past the helpless Gray before Strayezhka converted a penalty corner to make it 2-0. "We started tentatively and got a bit too anxious when we went behind," said Ireland coach Darren Smith. "Penalty corners proved to be the difference, with the Belarus team converting two of theirs while our chances went a-begging. "We will have to do our homework to get a good result from our next match against Spain." Lisa Jacob, Aine Connery, Audrey O'Flynn and Nicola Gray scored in Monday's victory over the Czechs.